Get the babies off the dump! attend the School Board Meeting with Parents For Life to shed light on the issues with Norrell Elementary. The health and welfare of the city’s children should be the primary concern of the Richmond City School Board. We are committed to remain vigilant in our demand for an excellent learning environment for our most vulnerable 3 & 4 year old preschoolers as well. We will remind everyone that we believe the previous school board has failed in their duty to our children. We are announcing a new program in Richmond- Southern Barton Heights Food Not Bombs. Southern Barton Heights Food Not Bombs is a grocery distribution, not a prepared meal. The model of a Food Not Bombs as just a grocery distribution is one used in many other cities, including Salt Lake City. We will put out produce on Monday mornings at 7am on the brick wall in front of the Wingnut Anarchist Collective at 2005 Barton Avenue. Any food left at the end of the day will be disposed of. You are welcome to come get produce to use, please me mindful of leaving some for others as well. 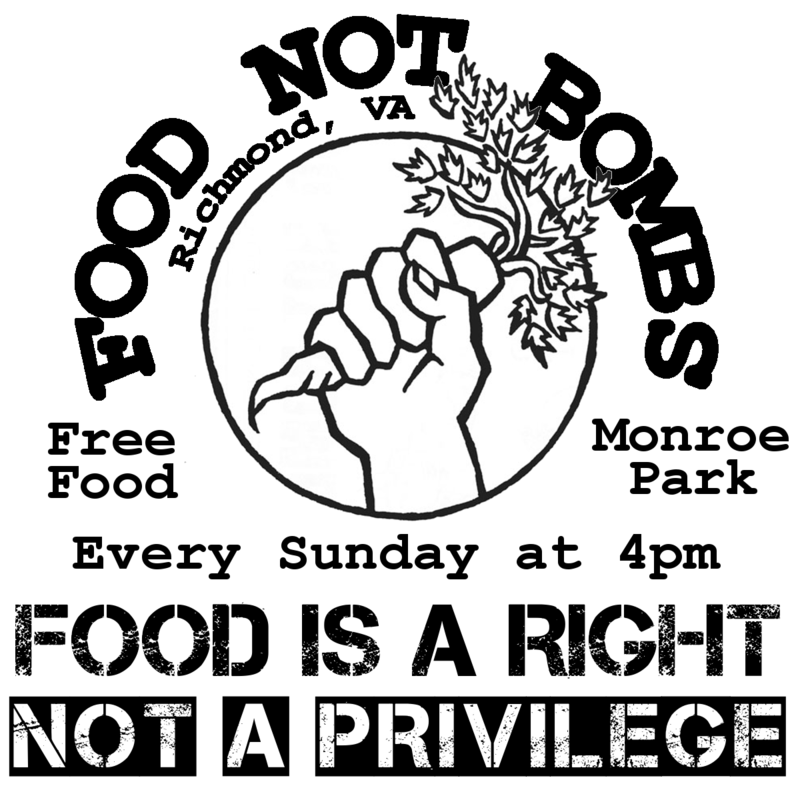 Don’t forget, Richmond still has Monroe Park Food Not Bombs (over 18 years strong), which serves a free vegan meal in Monroe park on Sundays at 4pm, followed by a grocery distribution. If you want to help cook or clean, come out on Sundays at 12:30pm to 2005 Barton Avenue. Houston Food Not Bombs Under Threat- Solidarity Requested! Just heard about some support needed for the Food Not Bombs group in Houston. Please take a few moments to make some calls or send some emails to help them out. Houston Food Not Bombs has been sharing healthy vegetarian food with hundreds of hungry people, several nights a week, for over 18 years and is a 2011 Recipient of a Peacemaker Award from the Houston Peace and Justice Center. Well funded Houston homeless service organizations, developers, and city officials are promoting new regulations for dozens of groups like ours that provide food for the homeless in Houston every week. Wednesday March 7, at the 9am session, Houston City Council will consider amending chapter 20 of the code of ordinances, imposing five new regulatory and licensing requirements for those who feed hungry people in Houston. These regulations would bring the work of non-professionals who do homeless service work under city and police purview. This law fits squarely in the context of criminalization of sharing of food across the country. Food Not Bombs participants in U.S. Cities have ended up in jail when restrictive new laws came into effect. 1) Circulate this email: We need religious groups, and others doing important work to make their calls to the City Council members Monday and Tuesday. 2) Come to City Council Tuesday March 6th to speak to City Council about this. Call Monday to register with the City Secretary: (832) 393 1100 and ask for 1 minute to speak (do not ask for 3 minutes). 3) Come out to a sharing at 521 Lamar St., 77002 (The Houston Downtown Public Library Courtyard) on Mon., Wed., & Fri. at 8pm, and Sunday at 7pm. Bring vegan food to share or just bring yourself! Checkout the RVA FNB website for this month’s meeting notes! Also, email rvafoodnotbombs@gmail.com if you want to be added to the Richmond Food Not Bombs google group email list! 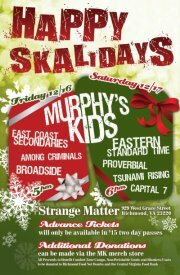 The local Ska band Murphy’s Kids puts on a holiday show every year called Skalidays. Every year the proceeds go to some community organization and they also collect canned goods for Food Not Bombs. This year, Skalidays is going to be a 2 day event – Dec. 16th and Dec. 17th at Strange Matter. Doors at 4pm and music at 5pm both nights. Usually Food Not Bombs attends the show and tables with literature/stickers/patches/donation jar. …Its a great outreach oppourtunity and the folks in Murphy’s Kids are super nice. Typically FNB takes care of the food stuffs i.e. brining boxes to collect and store the donations, keep tabs on them at the door so they don’t overflow the front door space and eventually haul them away at the end. We are going to need 2-3 people to table for each of those days if possible. We will need someone with a vehicle or a strong bike cart to carry the canned goods away. We probably don’t need more than 2-3 people a night, just because tabling at Strange Matter is pretty cramped. So get in touch soon if you want to help do outreach for Richmond Food Not Bombs! Also please respond to rvafoodnotbombs@gmail.com if you can bottomline Saturday Dec. 17th. Tell your friends, bring some canned and dried goods (oil, rice, pasta, veggies, spices, etc.) and enjoy some of Richmond’s awesome local music! Food Not Bombs serves on Sundays in Richmond. This month, one of the Sundays is December 25th, the Christian holiday Christmas. Due to the possibility of many people being out of town or unavailable on that day, we want to organize ahead of time to make sure we can continue to serve our free vegetarian community meal at 4pm that Sunday. There are some logistics we need to take care of to make sure we won’t have any problems with the usual Food Not Bombs business that Sunday. One thing is confirm our 3 usual pickup people can collect the donations that Saturday and Sunday. If any of them are not available- find alternative people to do the pickups. Confirm our pickups on Dec. 24 and Dec. 25- make sure we communicate to them that we WILL be showing up. Try and get a head count for who will be able to help out on Dec. 25th with Food Not Bombs- for all sections: Meal Prep 1-4, In the Park 4-5, and most importantly Clean Up 5-6:30. If anyone has special pickups or donations of food to help us prepare the meal on December 25th that could be super helpful! If anyone has a vehicle and will be available to help transport food from 2005 Barton Avenue to Monroe Park, get in touch! Rumors boutique will be hosting a Shop For a Reason event on Monday November 28th from 3pm to 7pm. 20% of all sales that happen during those hours will be donated to Eric’s legal defense fund. Eric Scott is a Richmond activist, anarchist, and Food Not Bombs participant. He is facing felony charges for wearing a mask during an Occupy Richmond march on the sidewalk on November 9th. Many people participating in that march had bandannas and other cloths over their faces, soaked in vinegar for protection in case the police used tear gas. Come support a local business owned by two amazing women who support the Richmond community in so many ways. Rumors is located at 404 North Harrison Street near VCU. Come out to the monthly Richmond Food Not Bombs meeting, Sunday December 4th at 1pm at 2005 Barton Avenue (where we cook every week). Some things we might talk about include, fundraising, how the can drive went, outreach, supplies we need, solidarity actions, ideas for the website etc. Richmond Food Not Bombs Canned and Dryed Goods Drive!!! Richmond Food Not Bombs is an organization that has been serving a free vegetarian community meal every Sunday in Monroe Park for almost 18 years now. Food Not Bombs is dependent on volunteers and donations to provide the money, food, and labor needed to make this vital meal happen every week. As winter approaches, Food Not Bombs is in need of financial donations as well as dry goods necessary to prepare the meal. Throughout November, Food Not Bombs will be collecting canned and dry goods at a variety of locations around Richmond. Please look for the Food Not Bombs box at a local business near you. Other donations can be dropped off at 2005 Barton Avenue. 506 S. Pine St., or 2608 Hanover Avenue. If you would like to make a donation you can bring cash or mail a check written to Richmond Food Not Bombs to 2005 Barton Avenue Richmond, VA 23222. There is now a donation box at Lamplighter Coffee Shop on Addison Street in the Fan! Canned vegetables, Canned Beans, Dried beans, Rice, Pasta,Flour, Sugar, Baking Soda, Baking Powder, Spices, Salt, Plastic Forks, Plastic Cups, Tomato Sauce, Vegetable Oil, Olive Oil, Vegan Butter, Shelf Stable Soy Milk, Tea bags, Soy Sauce, Sponges, Dish Soap, Aluminium Foil, Oven Mitts, Cleaning Products, etc. The only thing we ask is that people try to only donate items which do not contain meat, fish, eggs, or milk/cheese/dairy products, as we do not use those ingredients in our food preparation. Food Not Bombs cooks every Sunday at 12:30 at 2005 Barton Avenue on Richmond’s Northside. We share the meal at 4pm at the corner of Main and Belvidere in Monroe Park. And afterwards, we always need help cleaning up back at 2005 Barton Avenue.